I would have got there much sooner had I not stopped to take a picture of every windmill I saw. When you tell people that you have never been to Amsterdam and are going to cycle there, they all tell you their Amsterdam drug story. Seriously, even your gran has one and they are all the same. They start with a café and end with a freak out. All of them. Another thing people say is "why the hell would you do a ride like that at the end of January when it couldn't be colder?" 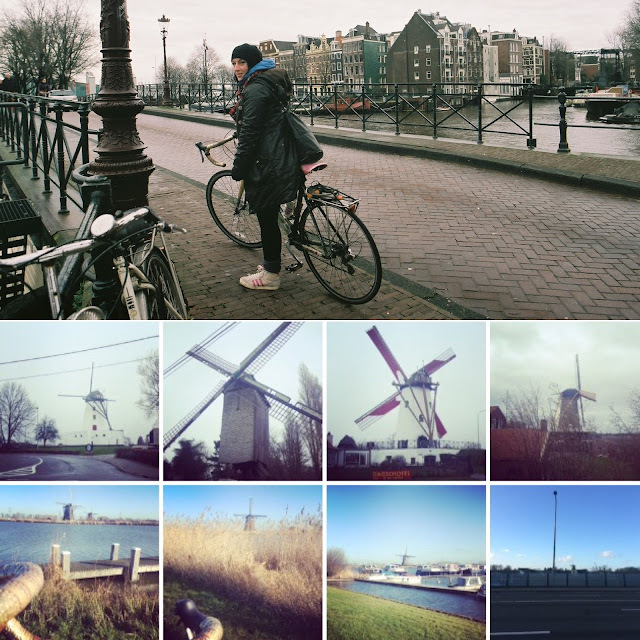 Well, I had spent all of 2015 in the UK and was keen to do 2016 differently and on top of that it had been a pretty crappy start to the year (boys, ¯\_(ツ)_/¯ ) so I was obeying my flight instinct and cycling away from my problems. Which, FYI, totally works. I was pushed for time but didn’t want to nail it there and spend all my time just cycling. I wanted to do some exploring too. So I cheated. I put my bike on the Eurostar from St Pancras. I wanted to go to Calais but the train doesn’t stop long enough there to take your bike off so I went to Lille which is only 75km from Bruges where I was going to immediately have a rest day. 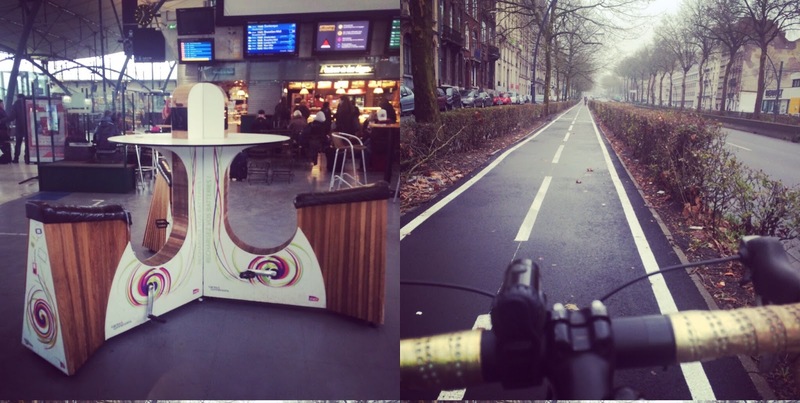 I was greeted off the train at Lille by a pedal powered charging station and off-road cycle lanes nearly all the way out of France to Belgium. All the way to Bruges there was a wide cycle lane on the road that cars were very respectful of. You get used to the whole riding on the right (wrong) side thing really quickly. I thought about taping a ‘Ride Right’ sign on my handlebars to remind me. It was such a chilled ride, I didn't even notice that I had crossed a border. Whenever I have a 'rest' day I like to climb up to the highest point and look at where I've come from and where I'm going (deep huh?). True to my nature of not understanding the point of rest days, I nailed Bruges and after climbing up Belfry Tower I did about ten other things. I should do a separate 24 hours in Bruges post to make everyone feel tired. I stayed at the Snuffel Hostel in Bruges which was €19 per night. They have a lock up for bikes and a buffet breakfast which includes these Lotus biscuit spread sachets that I pretend are energy gels. It took every fibre of my being not to leave behind all my clothes and tools and fill my panniers with them. Bruges is beautiful and you are absolutely allowed to have chocolate for all your meals if you cycle there. The whole morning was spent cycling off road along the canal to Ghent. I used this time to practise my no hands cycling which might not have been my brightest moment what with the canal right there. The entrance to the Sint-Annatunnel, the escalator inside the tunnel and the tunnel itself. Public cycle hire bikes outside Antwerpen-Centraal Station. They use the same bikes as Mexico City's Ecobicis. Cycling into Antwerp was weird because I couldn't see the bridge on my map. Probably because it was actually a tunnel. The Sint-Annatunnel is quite an experience, especially getting my fully loaded panniered-up bike on the escalators. Cycling through it was AWESOME. I managed to get a sweet last minute deal at the Century Hotel where they kept my bike in a corridor behind the reception. It overlooks the Antwerpen-Centraal railway station which is an amazing building. 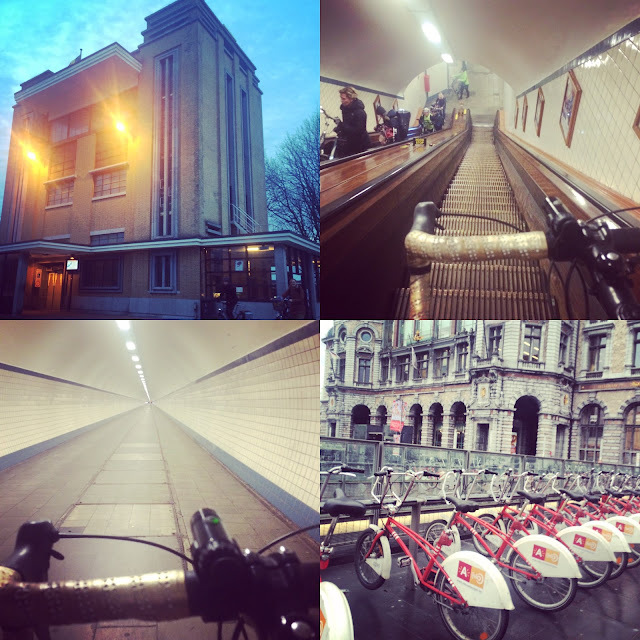 Leaving Antwerp I rode through a very J.G Ballardesque landscape that the Brutalist loving urbanite in me found magical. 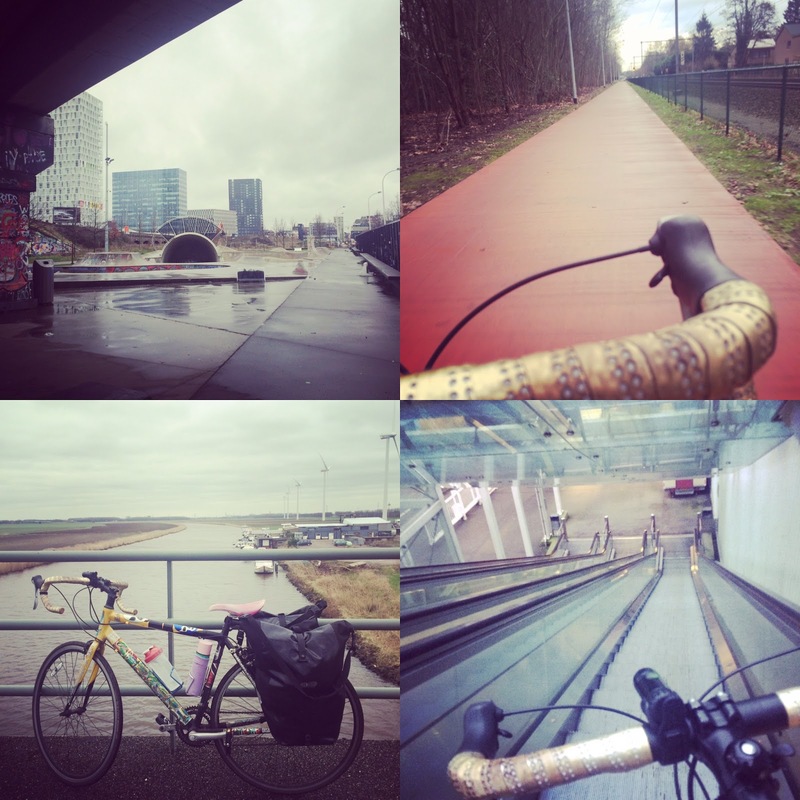 A lot of the route is on a red cycle lane called Georges Spelierlaan that runs parallel to a railway. After that I went through some amazing residential areas with some very unique architecture. Lots of neighbourhoods surrounded by water. Also, again I didn't notice that I'd crossed a border. The rain held off until the last hour. Almost not worth electric taping sandwich bags over my socks. 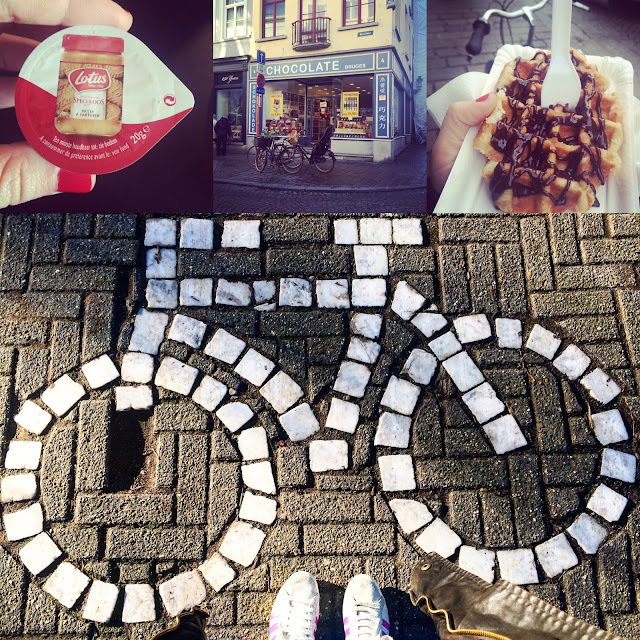 I loved Rotterdam instantly. As soon as I saw the Erasmusbrug Bridge I knew it was going to be cool. There is even a part of town called the Cool District. There is lots of street art around town so it's nice to just wonder around. I stayed in Hostel Stayokay Rotterdam which is in the Cube Houses over Blaak station near the food market. It really felt like I had rode into the future. The hostel was €20 with a buffet breakfast and there was a bike room where I could also hang my wet stuff. It was such a beautiful day. I really lucked out with this freak week of really mild late January weather. The thing about this trip is; the roads are really calm, flat and straight so you don't have to do much navigation and you don't have to slog up hills. The thing is I really like navigating and slogging up hills so the constant steady peddaling becomes a bit tedious. It felt less physically demanding than any of my other trips. It was a lot of time to be just in my head which would have got to me did I not have lots of things to talk to myself about. I did stop every now and then and just look around and think, wow, this is so fricken beautiful, I'm so lucky to have a bike and be healthy and alive and other deep crap like that. I arrived in Amsterdam as it was getting dark and the calm of the open road changed into the manic rush of hoards of bikes that the city is famous for. So Amsterdam is great, we had so much fun and I really want to go again when it's not freezing. And no, I don’t have an Amsterdam drug story but I do have a story about how a motorbike bent my bike in half while parked outside the Heineken brewery so I stripped it and left it there. But that's another story. 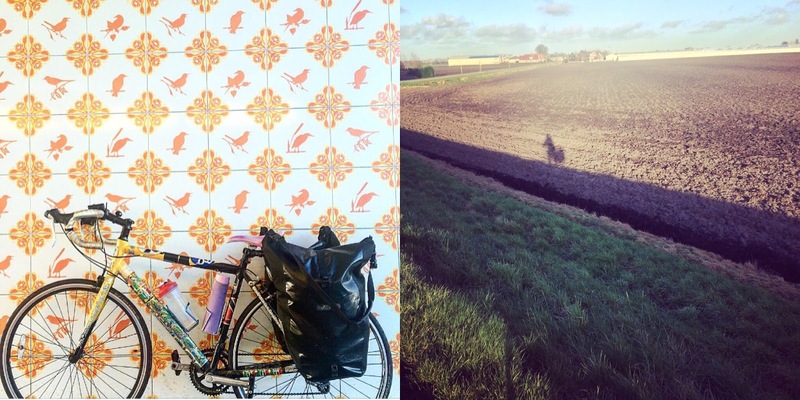 I'm going to cycle from Lille to Amsterdam next week with a friend, thank you for sharing your experience! !